After living in England for quite some time now, I have come to appreciate the significance and the passion the British have for their quest to find an exceptional Sunday roast. On Sunday mornings you will see people trudging from deepest darkest Hove, all the way to the furthest tip of the marina in search of a new and exciting roast dinner. 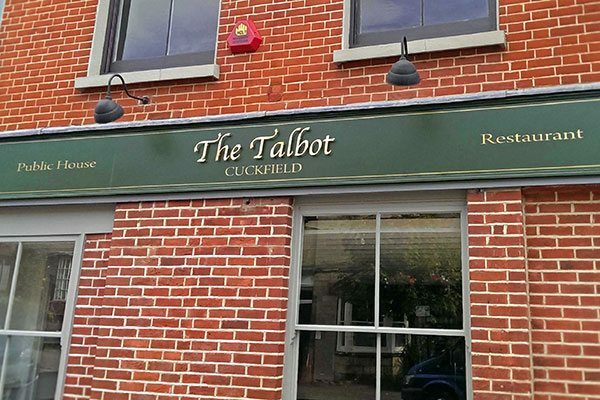 Often times we forget in our Brighton-centric lives that only a short drive over the downs are pubs that are creating fantastic food in a quaint country setting, and this is where I found the Talbot in Cuckfield. 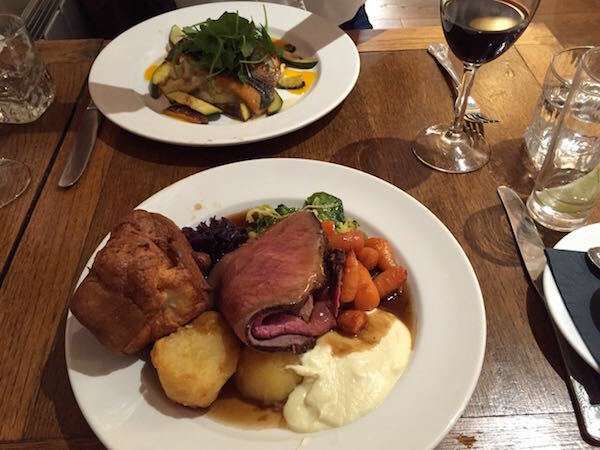 About a 30 minute drive through the beautiful British countryside is a classic little coach house in the centre of Cuckfield serving up some wonderfully fresh and locally sourced Sunday roasts. The town itself is charming and quaint and right in the centre of it is the Talbot. The first thing I noticed when we arrived was the big open courtyard that practically begs you to come and enjoy a cider in the sun. One of the greatest benefits of travelling just that little bit away from Brighton is finding a big beautiful beer garden to enjoy an afternoon of sunshine and summer drinks, which comes with the added bonus of being well away from pestering seagulls. I will definitely be heading back once the weather turns warm and sun properly starts shining. From the outside the Talbot blends with the town’s old world charm, but on the inside it has been newly refurbished and sparkles with glossy wooden floors and freshly painted walls. The pub is decorated with country touches and displays local artists’ paintings throughout, which gives it a open friendly character. We arrived a bit early and decided to have a drink in the front bar, a bright open space with plenty of seating, and we were greeted right away by the barman. I was thrilled to see that they have such a diverse wine list, and I love that they offer wine by the carafe, (because sometimes a bottle is just too much…not often…but sometimes). They also have several craft beers and ales on tap and by the bottle, and they also have my favourite Fever Tree tonic, perfect for a sunny G&T day in the courtyard. We took note of the room, and were pleased to see that though it is shiny and new, it is still as comfortable and as welcoming as its classic exterior. In front of the cozy open fireplace were local men sipping ale with spaniels sitting at their feet, and I could practically hear the wood cracking on a cold Christmas night, this pub is clearly lovely year round. With big open spaces and a sunny courtyard, its no wonder that Talbots is a favourite for families looking to catch up on a Sunday afternoon. The restaurant and the bar have several big tables that can accommodate families of all sizes, and the rooms are open enough that the groups can have their own space without encroaching on the more intimate diners. It’s clear that the re-furb was made with just that in mind. Though you can eat in the relaxed Bar area, we opted for a change of scenery and were happily escorted into the dining room. We were seated near the kitchen, able to watch the chefs churn out their Sunday best from their immaculate kitchen, while still getting to enjoy the lively dining room. Being from hospitality stock, I truly enjoy watching the way a restaurant works, and I love the honesty of an open pass and kitchen; plus you get to see the beautiful food coming out which often helps with the big decisions! The Sunday menu is fairly modest, boasting six starters and seven mains, and the dessert menu will make anyone with a sweet tooth very happy. 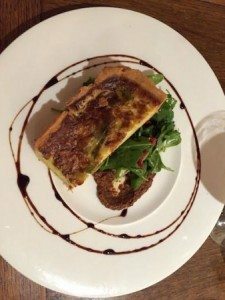 I was particularly impressed with the variety available and how well rounded the options were, from a light smoked salmon caper berry salad to a hearty home-made carrot and coriander soup with crusty local bread, this menu had something for everyone. After much debate and negotiating, my friend and I settled on the Leak and Gruyere Tart and the Pan Fried Pigeon for starters to share. When they arrived we both remarked on the lovely presentation. Each plate was dressed creatively and with care, we were very impressed. 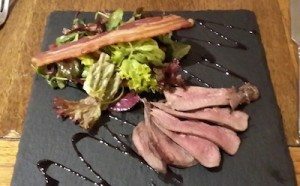 The Pigeon was cooked to a pink perfection, thinly sliced and presented on a piece of slate. So tender full of flavour the rare meat could have stood on its own, but was wonderfully complimented with a sticky sweet port glaze and a perfectly dressed salad. The dish was topped with a crispy piece of smoked american bacon, (which I loved) and that gave it smokey depth and a bit of saltiness. This dish was a hard one to relinquish when it was time to swap. Next was the Leak and Gruyere Tart, which was downright tasty. The pastry looked and tasted home-made, and the filling was rich and decadent. I thought that the sun-blushed tomato sauce really added to the dish giving it a salty and slightly bitter bite, which cut through the creaminess of the tart filling really well. With plates licked clean, we excitedly anticipated the next course. Many pubs in Brighton take Sundays a bit too seriously in my opinion, only serving up a roast on Sunday, so when I saw that the Talbot also offered a few alternatives I knew we had to try one. Along with Lamb, Pork, or Beef roast, they also had a home-made chickpea vegetarian tagine, a cajun chicken burger, a 8oz smoked beef burger, and a pan fried sea bass. We decide to mix it up a bit and share the traditional roast beef and the Seabass. When the food arrived we were wowed again with the presentation. As they say you eat first with your eyes, and they both looked fantastic. 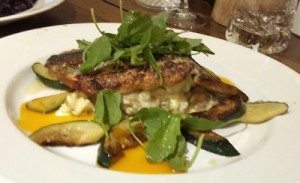 The Seabass was presented atop a neat pile of crushed potatoes, surrounded by delicately cooked courgettes, topped with a handful of fresh rocket, and finished with a bright yellow lemon gelee that gave the plate some sweetness and wonderful colour. The Seabass skin was crisped to perfection and the meat melted in your mouth, it was light and fresh, and I loved every bite. This meal could have easily been in a fine dining restaurant in London, yet here I was in Cuckfield enjoying expertly cooked Seabass, who knew?! We also ordered the rare roast beef, and wow…just wow! Served with a rainbow of seasonal vegetables the roast beef was the star of the day. 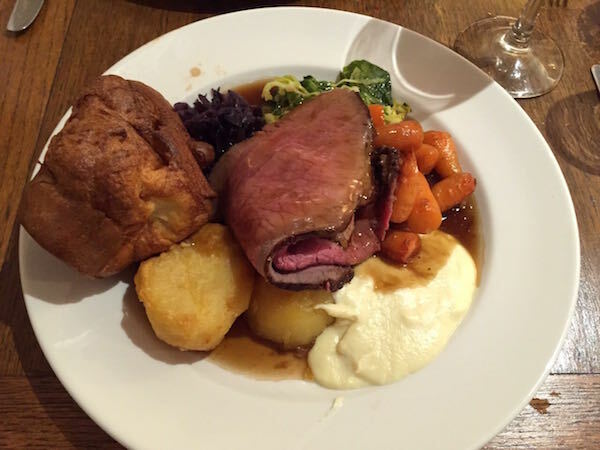 Cooked to a perfect rare and piled high, I can definitely recommend making the trip to Cuckfield to taste this roast. My friend even said the magical words ‘This is the best roast beef I have ever had.’ Since my husband is a chef I will watch my words, but I can also very highly recommend it. After being blown away by the mains, and again finishing every last bite, we were a bit dubious of the dessert course. But like good little soldiers we marched on, ordering the Summer Berry Crumble and the Sticky Toffee pudding. 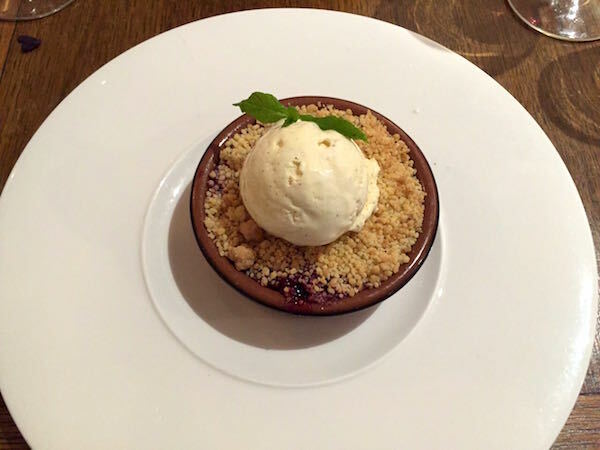 The berry crumble was clearly made from scratch and with the freshest berries, it was tart and sweet, topped with home-made clotted cream, just delicious. 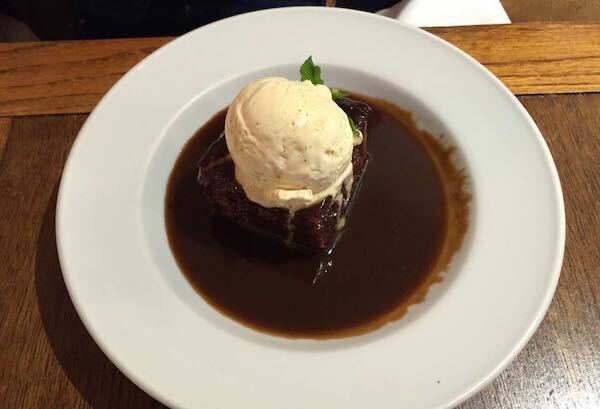 Last but certainly not least was the home-made sticky toffee pudding, and I can honestly say it really is the best I have ever had. The pudding was warm and gooey, and it was served soaking in the most decadent butterscotch sauce, that just thinking about it makes me need to go on a run, but it was so delicious I couldn’t stop eating it. I have already told all of my friends about it, and am very much looking forward to returning again to spend an evening drinking carafes of red wine by the open fire, and indulging once again in the welcoming atmosphere, friendly staff, and exceptional food at the Talbot. Read The Talbot food review.